Table 1. Rootstock growth as a function of salinity. *Rootstock variety difference significant for 2006 & 2007. Irrigation salinity impact insignificant. Plant tissue analysis showed a significant 0.5 to 3-fold increase in chloride and boron levels in pistachio but produced no toxicity symptoms in 2005. Some marginal burn was seen in the Well treatment in 2006. In 2007, some marginal leaf burn could be seen in all treatments, but did not seem to impact scaffold development or rootstock circumference. 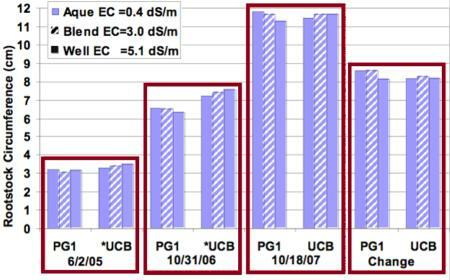 Due to small caliper rootstocks at planting and extremely high July 2005 temperatures, a significant number of trees needed to be rebudded Fall 2005 so that only 40% of the PG1 and 4% of the UCB trees had a full set of Kerman scaffolds by the end of 2006. UCB rootstocks, however, were significantly larger than the PG1 rootstocks, but this difference had disappeared by the end of this third season of 2007 (Table 1). By 2007 (year 2), scaffold development was complete on all trees (save a few replants), but the orchard as a whole was behind on development of tertiary branches stemming from the primary scaffolds. This is partially the result of two years of interplanted cotton, and the main reason why interplanting new orchards is rarely seen anymore. However, pistachios do not come into commercial bearing until their 7th year, allowing more time for this orchard to “catch up”, since cotton interplant was discontinued after 3 years. Cotton yields were unaffected by irrigation water salinity. Comparison of aerial analysis of the Normalized Difference Vegetation Index (NDVI) for 2004 and 2006 showed no treatment impacts on crop vigor across the field. However, final 2006 cotton yields showed a half bale loss for the Well compared to the Aqueduct treatment (3.12 and 3.68 bale/ac, respectively). Cool spring temperatures combined with significant increased seedbed salinity in the Well treatment (ECe of 8 to 11) reduced early season vigor. Plant tissue analysis showed a significant 0.5 to 3 fold increase in chloride and boron levels in cotton but produced no toxicity symptoms (check this).